Welcome to our complete Dwarf Hamster Care Guide. Letting you into the wonderful world of dwarf hamsters. Giving you all the top tips on how to take care of a dwarf hamster that you will need. 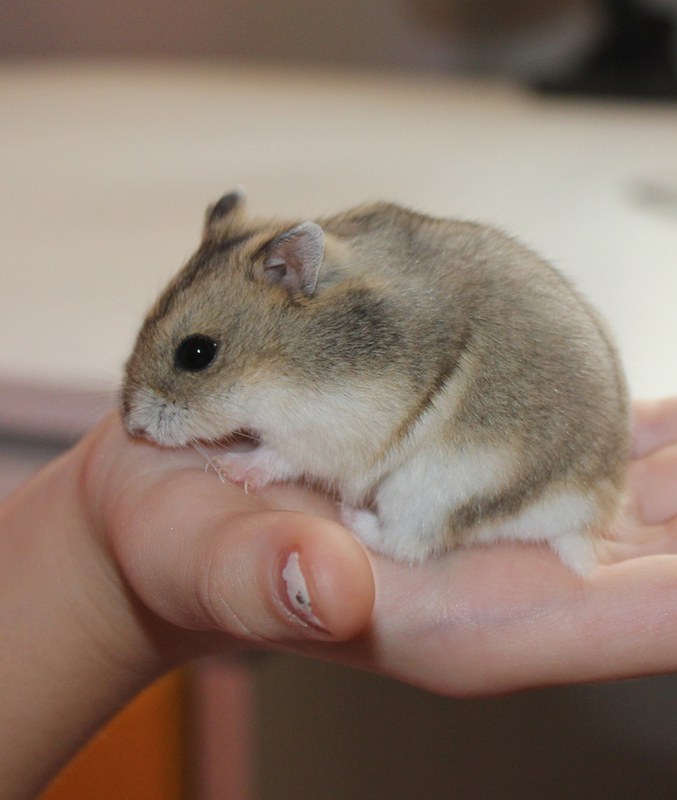 Dwarf hamsters are cute, fun and make good little pets for older children and adults. With proper love and attention, they can thrive for several years in your home. Let’s take a closer look at what you can do to make a good life for your little pet in our dwarf hamster care guide. When getting a dwarf hamster, you will need to do several things. 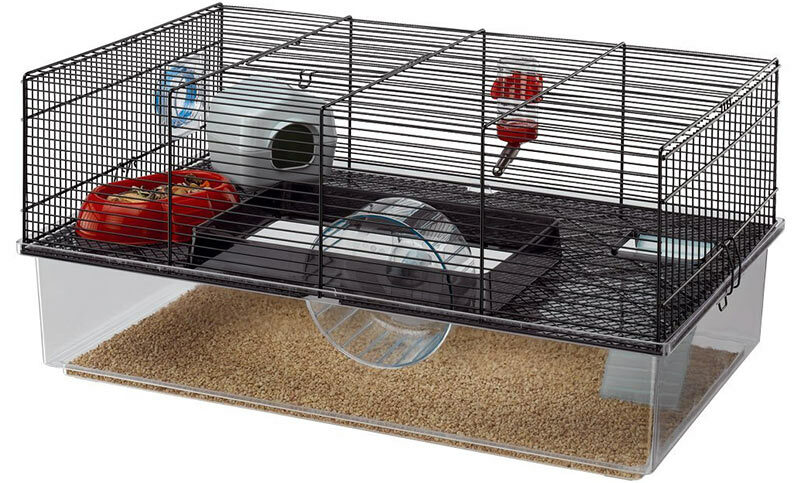 Get a proper cage with good bedding, provide a proper diet for your pet, and get an exercise wheel for your pet. Robo dwarf hamster care, Russian dwarf hamster care and Chinese dwarf hamster care are all very similar. 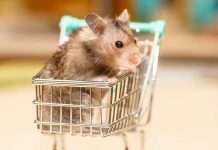 The main difference being that if you have a tiny Chinese hamster or Roborovski hamster, you will need to make sure you buy a cage that they cannot escape from. 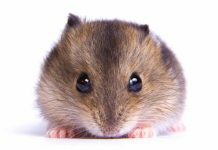 Let’s take a look at each of these important aspects of how to take care of a dwarf hamster below. Although dwarf hamsters are very small, they need ample room to live in. We recommend at least 1 cubic foot of space for your hamster to live in. If there will be more than one hamster, you will need to add an additional 0.5 cubic foot of space. Even Robo dwarf hamster cages need to be at least that size. If you want your pet to be happier, get a larger sized cage. Especially if there will be more than one hamster living in there. Do dwarf hamsters like company? Some breeds of dwarf hamster, when raised from the same litter, will like to be kept together. But this is not true for them all, and you will need to monitor your hamsters carefully to make sure that they are being kind to each other. 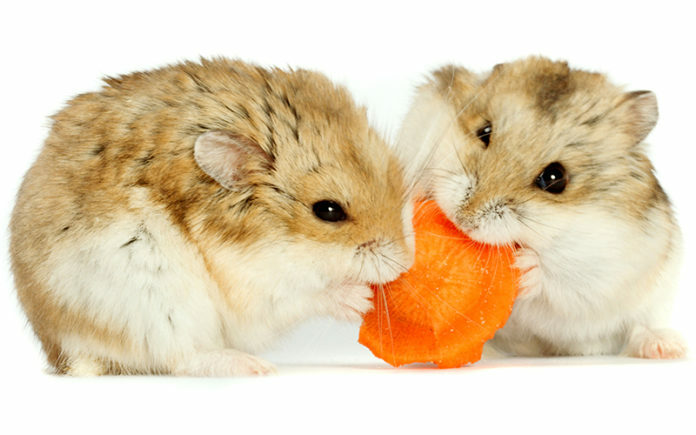 To find out all about keeping two hamsters together, check out this article. As we mentioned above, dwarf hamster homes need to have at least 1 cubic foot of space for one hamster. Keep in mind that the bar spacing should be no more than ¼ inch wide to prevent escape. If your hamster can fit his head in between the bars, then it is too wide. For ventilation purposes, we recommend a wire cage with a plastic bottom. It is also easier to clean this type of cage than others. Just remove the wire off the base, clean out the bedding, and wipe down the wire part and bottom as necessary. If the cage already comes with plastic play tubes, you will need to clean those out as well. If not, then give your little hamster some empty toilet paper rolls or some small cardboard cutouts to run and hide in. To get a complete guide to keeping your hamsters home fresh and clean, check out our How To Clean A Hamster Cage Guide here. There are a lot of opinions on the best Russian dwarf hamster cage. But one of our top choices on Amazon is the Ferplast Hamster Cage. It has two levels, which increases living space. The upper floor is ideal for relaxing and eating. There is also a ladder for your hamster to climb down to the bottom level, where he could exercise and play with the built in hamster wheel. But there are lots of great options to choose from. Check out a massive range of hamster tanks that might suit your tiny friend here. When choosing bedding for your dwarf hamster, you will want something that is comfortable and non-toxic for your pet. We do not recommend pine or cedar shavings because they may cause respiratory ailments such as asthma. So choose something that is soft, non-toxic, and highly absorbent to prevent odors from appearing for a longer period of time than wood shavings. 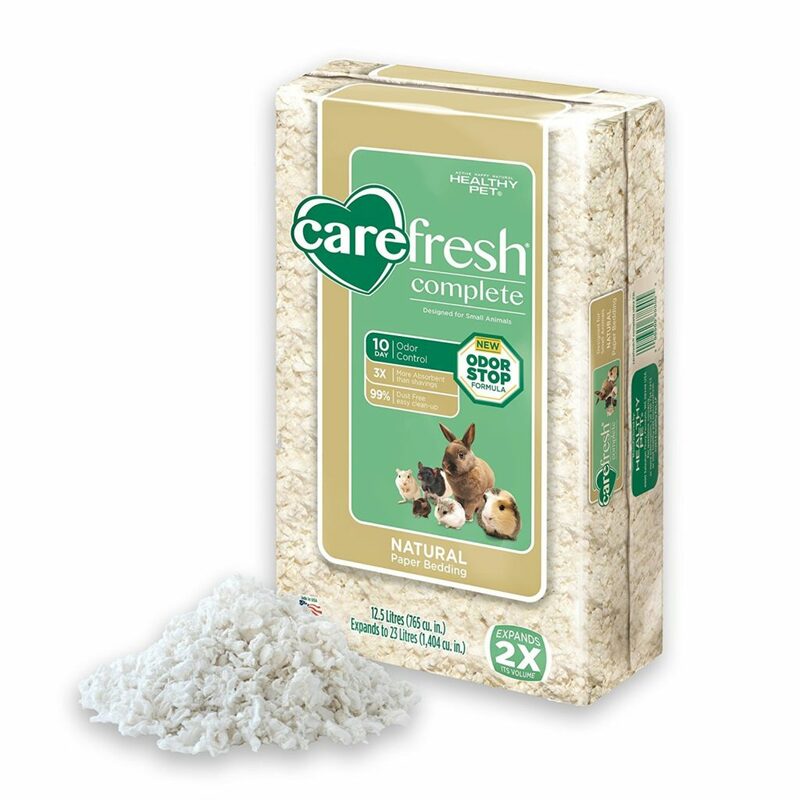 We recommend the Carefresh Ultra Pet Bedding for those reasons. It is a bit pricier than other kinds of bedding, but is a good investment due to its effective odor control and absorbency. 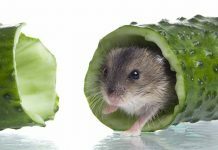 By now, you must be wondering what is a healthy diet for dwarf hamsters? For the most part, they should be fed commercial hamster mixes. These contain seeds, nuts, and grains. As for fresh food, they can have a small amount of certain fruits and veggies like apples, carrots, pear, cabbage, and broccoli. Do avoid citrus fruits like oranges and lemons because they are too acidic for your dwarf hamster’s stomach. 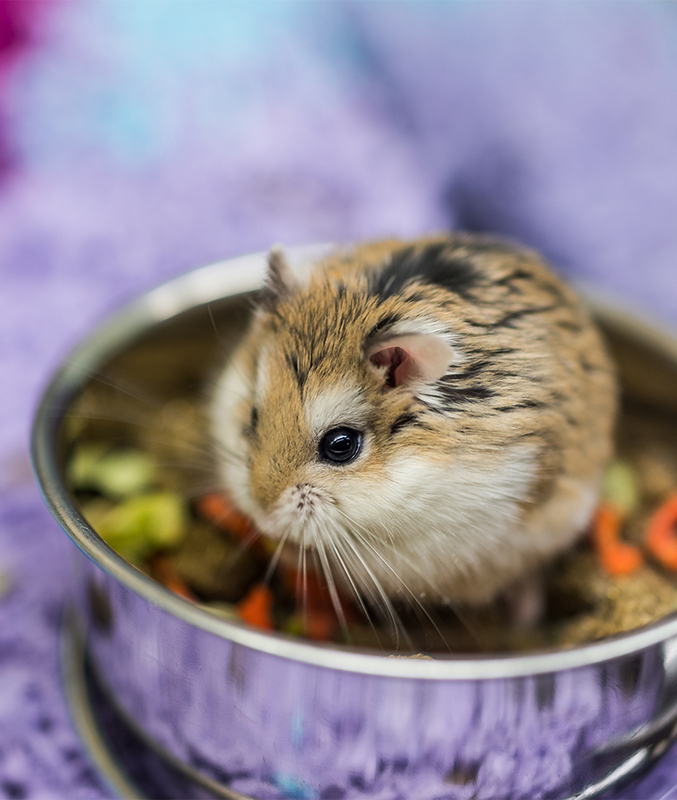 As we have mentioned, the best food for dwarf hamsters is a commercial mix of grains, nuts, and seeds. 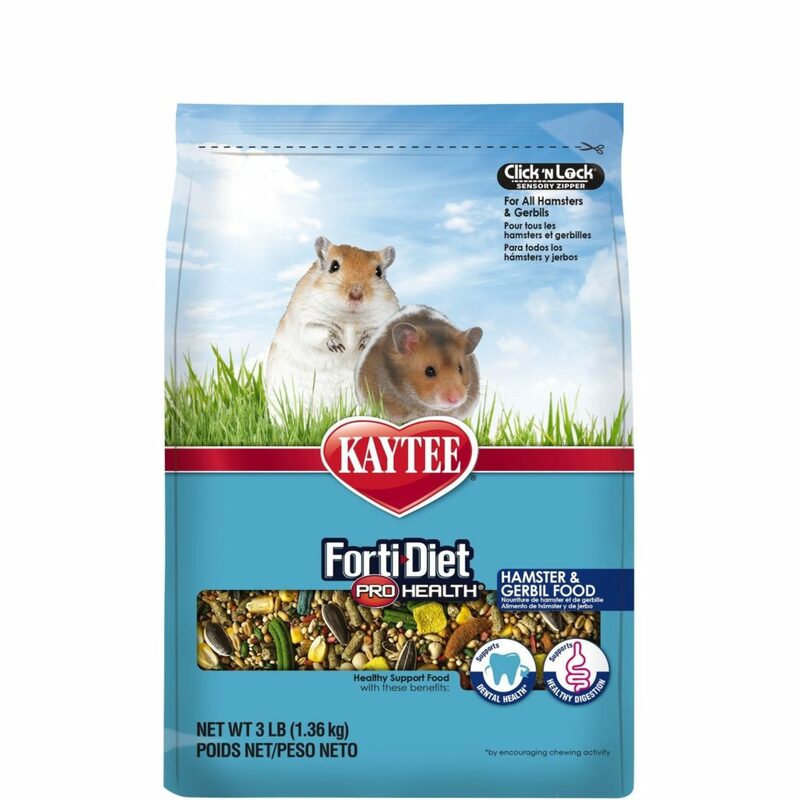 Here are three highly rated hamster food packages that we recommend. This food has prebiotics and probiotics. It has larger and crunchy pieces of food that encourages more natural chewing for dental health, and is naturally preserved. 2. 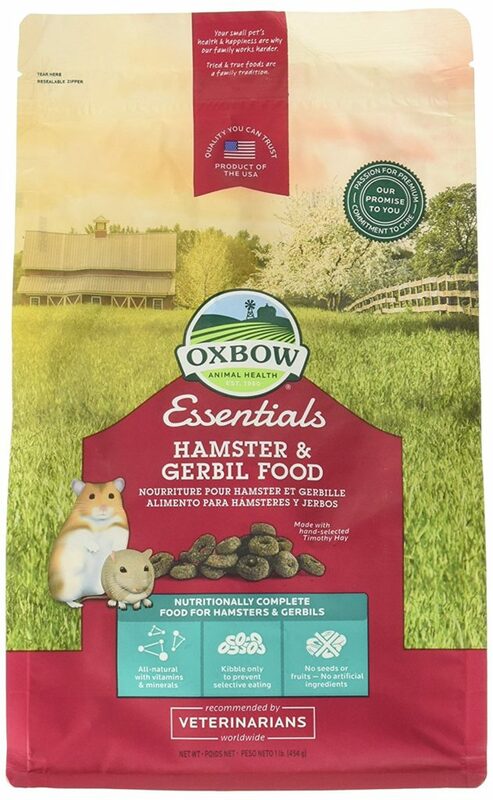 Oxbow Animal Health Hamster and Gerbil Fortified Food. This contains timothy hay, barley, and oats. 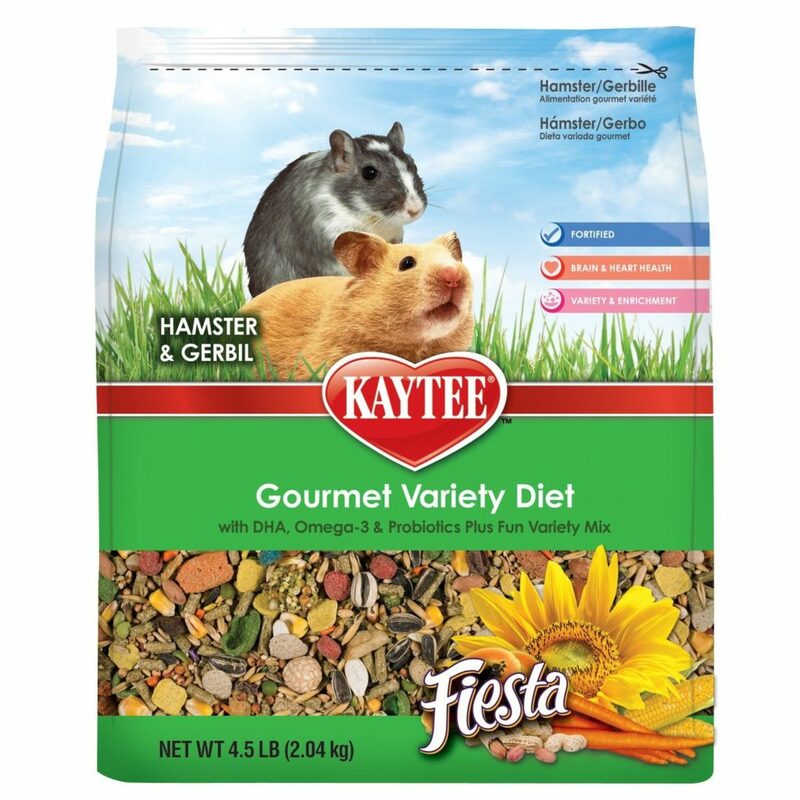 Kaytee Fiesta Hamster Food consists of a healthy blend of fruits, vegetables, grains, and seeds. They offer taste and nutritional variety for your hamster. A dwarf hamster will need a handful of food each day. They are likely to hide this in their bed and store it. So every day when you refill the bowl collect the old food from their bed. Treats for dwarf hamsters are fun and tasty and are a good way to bond with your pet. We all know how motivated our pets can be when we offer them treats, so it is best to try and train them when giving them the treat. 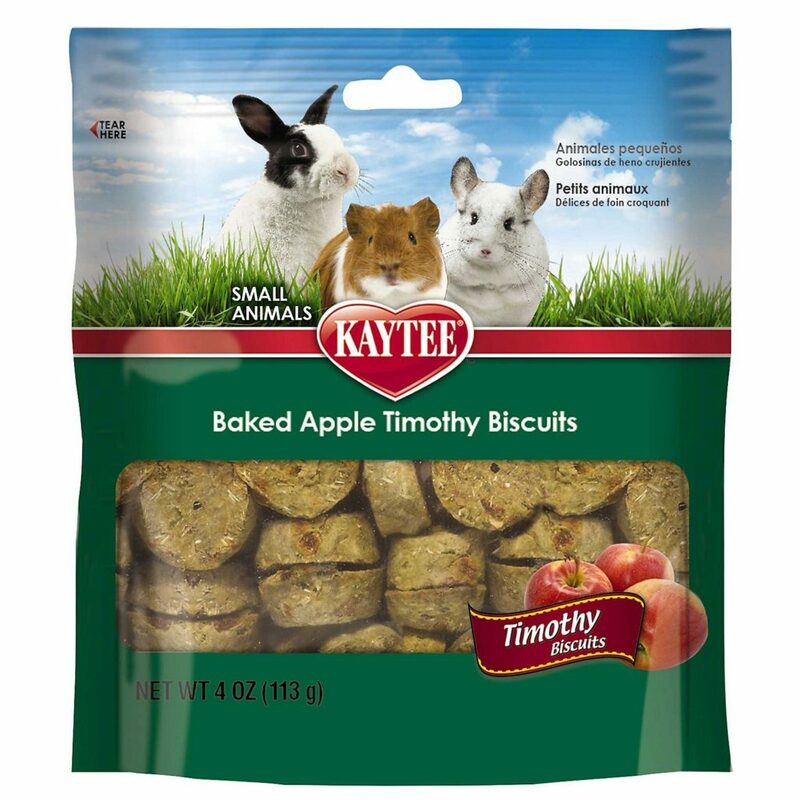 Kaytee Timothy Biscuits Baked Apple Treat is one of the best treats for dwarf hamsters. These biscuits are nutritious and great for chewing on. 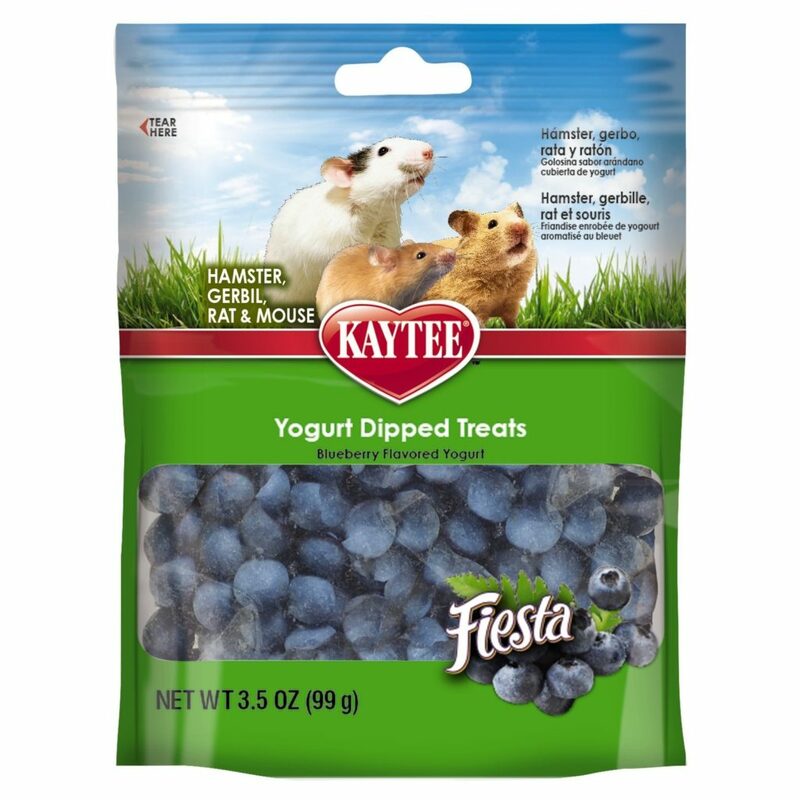 Kaytee Fiesta Blueberry Flavored Yogurt Dipped Dwarf Hamster Treats are another popular and tasty treat. Keep in mind that treats should be given sparingly and are not a substitute for a healthy, well-rounded meal. 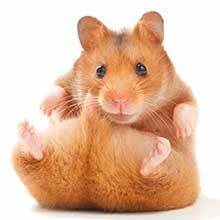 Check your hamsters bed daily to make sure they haven’t hidden any food in their that might become unsafe if left. Dwarf hamsters need to always have access to fresh water from a water bottle. Most water bottles conveniently attach to the cage, while some are freestanding. Choco Nose H128 is one such water bottle that attaches to the cage. It is simple and easy to install. It is also easy to snap the water bottle on or off for cleaning and refilling water. If you use a water bowl instead, then make sure you store it somewhere in the cage that it cannot become contaminated with bedding. Change your hamsters water for fresh water every single day, regardless of how much she has drunk. Running wheels are a healthy addition to your hamster’s life. Hamsters naturally love to run and will do so for many miles per day in the wild. 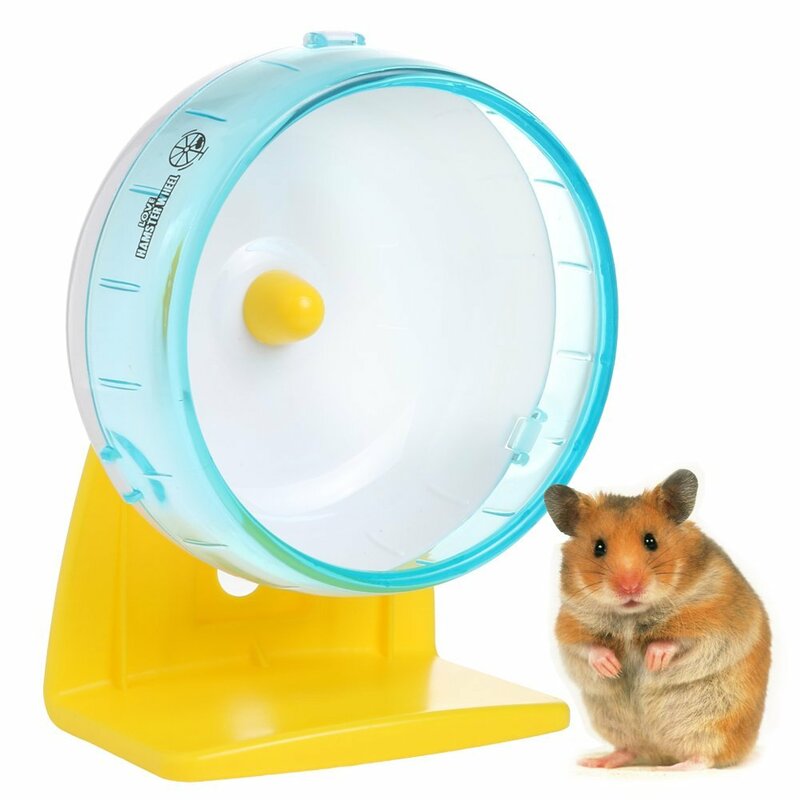 Since your hamster will be caged, providing a quality wheel will make a positive difference in your hamster’s life. There are two types of materials made for hamster wheels. One is metal and the other is plastic. Metal wheels last longer than plastic wheels, but the concern with those is that they tend to have rungs where your hamster’s legs can fall through and get hurt. Plastic wheels tend to be made of one solid piece, so we recommend that. 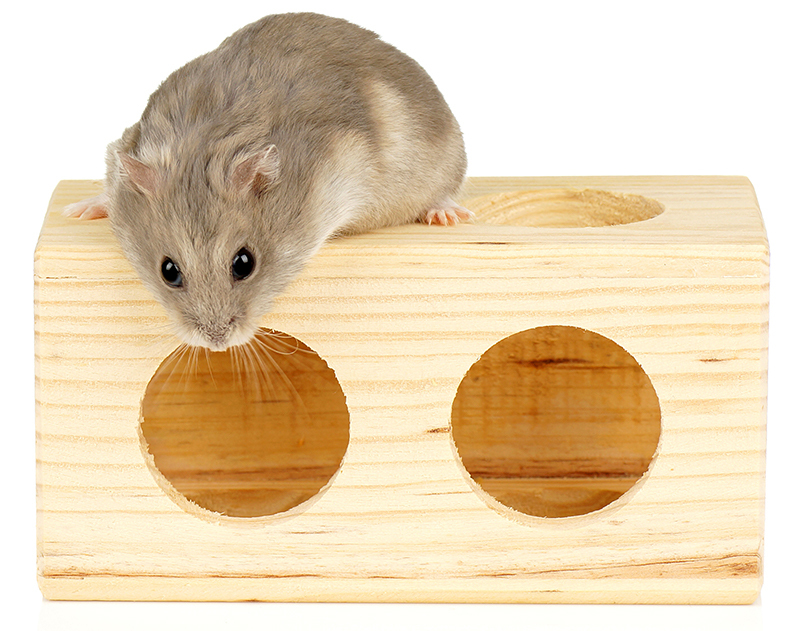 Dwarf and Roborovski hamsters need a minimum wheel size of 6.5 inches. It is really important that you avoid getting a wheel that is too small for your hamster. The larger the wheel size, the better it is for your pet because it doesn’t have to arch its back as much while running. Arching its back while running is dangerous for your pet because it can cause spinal injuries. That said, we recommend Love Hamster Wheel. It is plastic and 8.3 inches in diameter, which is ample room for your dwarf hamster to run in. If you want to set up your own dwarf hamster cage, get a large wire cage with a plastic bottom. The minimum square footage should be at least 360 square inches. We recommend getting the biggest one you can afford. You will want to add a water bottle, a hamster wheel, comfortable bedding, a nest, and some toys for your hamster to run around and hide in. You can find some great hamster toys to keep your pet entertained here. Dwarf hamster balls are small, clear, ventilated plastic balls, which your dwarf hamster can securely explore in. These hamster balls are a great place to temporarily place your hamster while you’re cleaning his cage. Just make sure to put them on a safe level of your house so they do not accidentally fall from a higher level to a lower level. Two very popular hamster balls on Amazon are the Kaytee Dwarf Hamster Mini Run-About Exercise Ball and Lee’s Kritter Krawler Mini Exercise Ball. In conclusion, we hope you’ve found our advice to be helpful on how to take care of dwarf hamsters. Your hamster needs to get used to being handled slowly and gently. To begin with simply let him get used to you putting your hand in his cage and gently stroking his back. For the first few days offer him little treats and pet him gently in his cage. When he seems comfortable and doesn’t run away, cup your hand under him and lift him up. Pick him up for thirty seconds, then gently put him back in his cage. Repeat this several times a day, very gradually increasing the length of time you are handling him. Remember that dwarf hamsters are very small and fragile. Do not squeeze your hamster or drop him from a height. Make sure that you supervise any children who are interacting with him to avoid rough handling. Some breeds of dwarf hamster, Roborovski and Chinese, are very fast. They often won’t sit in your hands the way Syrian Hamsters and Russian Dwarf hamsters do. Make sure that you are happy for them to keep moving between your flattened hands, and don’t give them the opportunity to run away! Dwarf hamsters need a cage with plenty of space, appropriate bedding and fun toys. They need feeding with complete hamster mix once a day, as well as fresh water daily. They need handling with care and cleaning out at least once a week. If you can commit to this, then your dwarf hamster should be a happy and healthy companion. Do you have any advice you would like to share about taking care of your dwarf hamsters? If so, please let us know in the comments section below! Previous articleCan Ferrets Eat Chocolate? Next articleCan Hamsters Eat Mealworms? BUT I NEED THE HAMSTER AND WHAT FOOD BOOL AHHHHHHHHHHHHHHHHHHHHHHHHHHHHHHHH!! !